What’s the secret to having beautiful hair, skin, and nails? The answer can be found in your kitchen! There is no one magic ingredient that will keep us looking young forever, but an overall well-balanced diet (with lifestyle and attitude) plays a huge role in how we look. Focus on Protein, the building blocks of skin, hair, and nails (keratin, collagen, and elastin). Foods: Lean meats, seafood, poultry, legumes, and eggs. If your diet is lacking in the power of protein, you may notice hair loss, brittle nails, or dry skin. Protein should be about 10-35% of your daily calorie intake for healthy growth and maintenance. Go Fish! Our bodies also need essential Omega-3 fats (ALA, DHA, EPA) to make shinier hair, clearer skin, and stronger nails. Oily fish like salmon, tuna, mackerel, and sardines are full of Omega-3’s. Can’t do fish? Plant sources like walnuts, flaxseed, and peanuts also contain Omega-3’s. No need to go mega-dosing on fish oil supplements; all you need is 8-ounces of fish per week. Fruits, vegetables, and whole grains are full of health boosting antioxidants our bodies love. Focus on these to get the most benefits. Combine tomatoes, oranges, green onions, 4 tablespoons cilantro and jalapeno pepper in large bowl. Season, if desired, with salt and ground black pepper; set aside. Blend I Can’t Believe It’s Not Butter!® Spread, remaining 2 tablespoons cilantro and, if desired, salt and pepper to taste in small bowl. 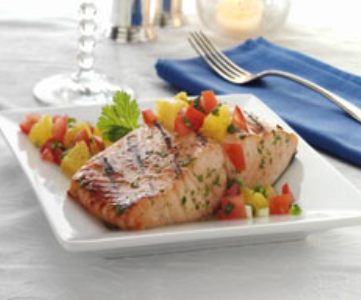 Grill or broil salmon, brushing with cilantro spread, until salmon is opaque, turning once. Serve salsa with salmon.